To understand why I love the tiny, free FlashFire utility/driver, you'll need a little background. I bought an original Acer Aspire One netbook with an 8GB solid state drive instead of a hard drive to keep the weight down. I replaced its custom Linux OS with XP--but XP, not being optimized for a super-slow SSD such as the one on my netbook, froze every half minute or so for 5 to 15 seconds while data was written to the disk. It's not long before such behavior starts driving you nuts. This reboot warning is the last you'll see of FlashFire. Once it's installed and running, there's no trace of it except improved performance. All my tweaks to Windows to minimize disk writes helped but little. XP continued to stutter--until I installed FlashFire. Then, not only did the stuttering stop, XP booted considerably faster and the overall subjective performance amazed both myself and several of my colleagues who'd never seen a netbook perform that snappily. The author's wiki describes FlashFire as a ram buffer. I'm not certain of the details, but since SSDs perform at their worst when reading and writing simultaneously, my guess is that the software caches and delays writes. Delaying writes means there's a small chance for data loss or file system corruption if your system crashes before data in the buffer is written. 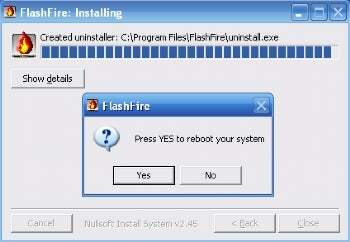 Personally, I have never experienced, nor have I ever heard of, anyone suffering significant problems with FlashFire. However, you are explicitly warned and use the software at your own risk. Though Vista and Windows 7 don't suffer the same stuttering problem XP did, I've also used the FlashFire version for those OSs. Although it seemed to make operations perkier, those PCs didn't show the same jump in performance. However, the utility is free--so if you're stuck using a slow SSD or just want a bit better performance, check out FlashFire.